Evolution Computing provides a CAD file viewer program that is free for single users , subject to the terms listed below. CADView/7 can search drawings for text, bookmark a sequence of drawings for orderly presentation, zoom in or out, or to named views, change visible layers, etc. 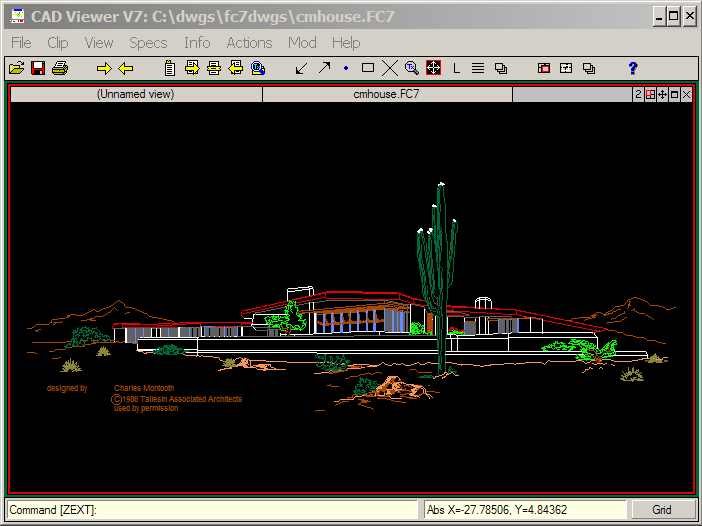 CADView/7 uses the same high-speed vector engine as FastCAD and EasyCAD. While it does not display rendered images, it will show saved views of 3d objects in wireframe or hidden surface form. For individual users, there is no charge for CADView7! Go ahead and download it for free directly from this website. All we ask is that you register by using the form on our CADView/7 download page (see link below).